Often referred to as the “8th wonder of the world,” the Palm Islands are one of Dubai’s most ambitious and impressive building projects. The luxurious shoreline of the palm tree shaped artificial island is full of villas, resorts, fine dining, shopping malls and even a water park. Drinking water for the island’s residents comes from two seawater desalination plants. Reverse osmosis and a host of KSB pumps and valves work to produce 32,000 m3 of pure drinking water every day. The tried and true radially split HGM-RO series high-pressure pumps bring ultra-smooth running properties and excellent efficiencies which markedly reduce energy consumption. This along with its maintenance friendly reputation spell rock bottom life-cycle costs (LCC). The island’s core desalination process also uses powerful Omega and RPH-RO series pumps. Ensuring reliable control of this enormous amount of water is handled by 86 KSB Isoria shut-off butterfly valves with nominal diameters ranging from DN 150 to DN 1000. The smooth interaction of our products in this system and the resulting high levels of efficiency and reliability convinced our customers, and were key to winning the contract. 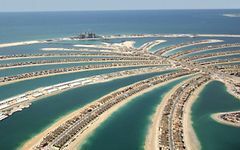 The Palm Jumeirah, a palm treeshaped artificial island, is probably one of Dubai’s most ambitious building projects.